This is by far one of the stupidest stories ever, and for some reason it created quite a stir in our little town high school when we did it. Enjoy. Back when we were in high school, my friends and I went through a "phase" where we thought we were totally awesome billiard players. My friend "Rick*" had a pool table in his basement, and we spend endless hours shooting pool and practicing trick shots we'd seen on TV. In addition to being barely competent pool players, we were AVID fans of the movie "The Color of Money." If you have not seen this movie, I'm telling you right now that you really should because it is awesome. Even though Tom Cruise is a total crackpot these days, there is no disputing that the guy is AWESOME on the big screen. Paul Newman also gives an unforgettable performance, and was rewarded with an Academy Award for it. The movie was released in 1986, and stars Tom Cruise, Paul Newman, and Mary Elizabeth Mastrantonio (she's HAWT). Newman reprised his character "Fast Eddie" that he had previously played in the 1961 movie "The Hustler." 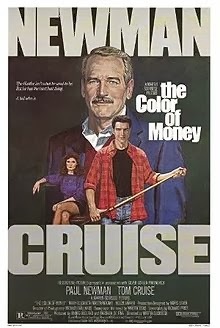 "The Color of Money" tells the story of how a retired professional billiard player (Fast Eddie Felson) hears/sees Cruise's character (Vincent) shooting pool against some other fellow in a bar. He immediately becomes engrossed in Vincent's game, and sees a lot of himself in Vincent. Eddie decides to take Vincent under his wing, and take he and Vincent's girlfriend "Carmen" on a cross-country pool hustle to make a boat-load of money. When he goes to Vincent's place of business to pitch him the idea, he finds Vincent in a retail toy store (similar to Toys R' Us) where his "uniform is jeans and a black t-shirt with his name "VINCE" in white letters across the chest. Eddie encourages Vincent to wear the "Vince shirt" on a few pool hustling excursions to display his cockiness and throw off his opponents. Needless to say..my friends and I took inspiration from this - and after a trip to the t-shirt shop at the mall - the four of us ended up with our own version of the "Vince shirt" - only with our nicknames instead of the name "Vince." My shirt of course said "MOOKIE." Rick's said "SLIM" because he was losing weight at the time (plus it was a cool pool name). "Devin*" had "SHARK" (because he saw himself as the best stick in the group, which he may have been - but we never let him think that). These shirts were so cool (at least we thought they were) that we decided that we needed to all wear them on the same day to school...because that would be even cooler. So the following Monday morning we all wore our shirts to school, and for some reason EVERYONE took notice. We fielded questions all day from our friends as to what the point of the shirts were, why we were wearing them, and either received a "COOL!" exclamation or a dismissive eye-roll because they thought we were idiots. I still remember standing up in Speech Class giving an assigned 5-minute "introduction-type" speech about Jim Morrison - while wearing my MOOKIE shirt, black pinstripe Z Cavaricci dress pants, and black boots. I was classy. After attending a few classes, it wasn't long before word got around the teaching staff that there were four of us rolling around the school in matching dark shirts - that were clearly not part of a school-sponsored activity. As a result of such, by lunch each of us had received some sort of third-degree questioning from a school administrator. I want to say one or two of us were even pulled out of class and into the hallway to see what the attire was all about. I remember most teachers being good-humored about it - especially since they knew we were all "good boys," but it seemed they didn't want to take any chances that there may be a "gang" on the premises. Yeah..we were a gang alright...a gang of silly d-bags with an over-active appreciation for Tom Cruise characters. This was way before Columbine, 9/11, or any of the scary school shootings - so the idea they were so up-tight about the shirts was sort of odd at that point in time. Its still a little odd now, but I can see where they'd be concerned these days. I don't remember if we ever all wore them in "unison" again, but I know we randomly wore them throughout the rest of that school year, and they continued to get quality responses when we did. I only wish we'd have taken a group picture with them, because that's one thing I don't think we did. That would have been a nice keepsake. I have to report that I still have the shirt in a box of my belongings. It would be a little tight, but I should pull that bad-boy out.